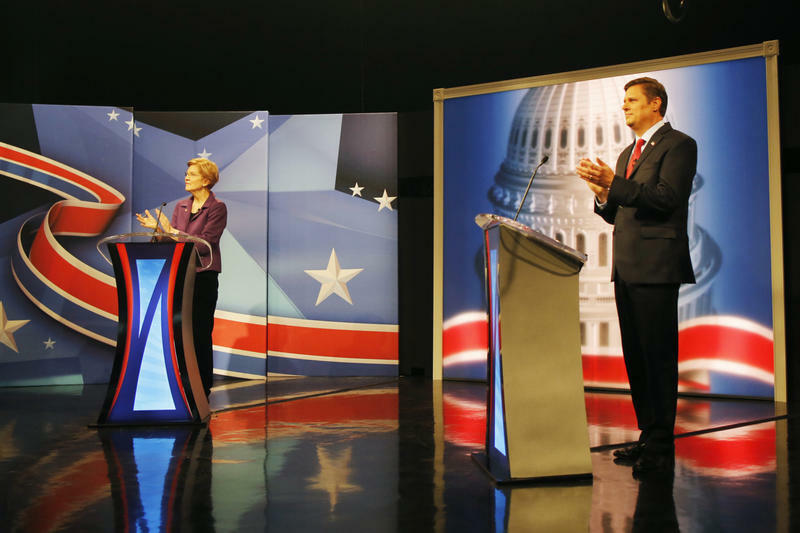 The last debate of the Massachusetts governor's race took place Thursday night, broadcast on WCVB-TV. Charlie Baker, left, and Jay Gonzalez. Polls are showing Gonzalez trailing the incumbent Baker by more than 40 points. Baker and Gonzalez stuck to familiar themes throughout the hour-long debate. Baker heralded accomplishments from his first term, such as investing in off-shore wind projects, fixing the Health Connector and finding housing for 1,500 homeless families who were staying in hotels and motels. Gonzalez tried once again to connect Baker with Republican candidates who support President Trump. "You are putting loyalty to the Republican party above your commitment to these values, and I think it matters, which is why I'm running for governor and not some other place, because I think we need a governor who's going to stand up and be consistent on these issues," charged Gonzalez. "I didn't vote for Donald Trump," countered Baker. "I don't plan to vote for him if he runs for re-election. Most people know where I'm coming from with respect to the president." Baker also criticized Gonzalez, accusing his opponent of wanting to do too many things without having the money to pay for them. "It's so dishonest to say to the people that he can fund the north-south rail link, that he can fund east-west, the Blue Line, that he can fund the Red Line expansion," said Baker. "These are tens of billions of dollars in projects for which he's offering plans that, many of which don't start until four years from now to generate any revenue." There was one issue the two candidates agree on: the need to address climate change. Both support some sort of carbon tax. Baker says he wants to see a regional approach, like the state already does in its Regional Greenhouse Gas Initiative. When it comes to protecting the state from the effects of climate change, Baker says his administration has already started vulnerability planning in every Massachusetts community. "Once it's done, we'll do hazard mitigation planning for all those communities and then once we have that, that's the blueprint for dealing with climate change here in the commonwealth," said Baker. "We are setting a national framework that many other states are grabbing onto and pursuing on their own." "There isn't anyone who follows what's happening on climate change and what we're doing in this state that thinks the governor is being ambitious enough on this. Other states are starting to and will be outpacing us if we stay on his schedule," he said. In making his closing statement, Gonzalez said he's run into a lot of people who say Baker is doing a good job, but "when I ask them why they think so, the answer is never that he's doing a great job fixing our transportation system or making progress on some other issue that affects peoples lives. It's usually something like, 'he seems nice, and I'm really glad he's not one of those crazy right-wing extremists.' Well, the measure of whether our governor is doing a good job shouldn't be that he's nice and isn't crazy," said Gonzalez. In his closing bid, Baker said hearing from, and getting to know, the people of Massachusetts has been a joy. "One of the things we pledged to do when we took office was that we would work together with our colleagues in local government and in state government to move this commonwealth forward. Our economy is booming, our schools are terrific, but the final thing I want to say tonight is that our people are great and I hope you give us a chance to continue the work we're doing on Nov. 6," he said. Friday is the last day of early voting in the state. On Election Day, Tuesday, Nov. 6, the polls will be open until 8 p.m.
On Question 1, What Can Massachusetts Learn From California? In Massachusetts, ballot Question 1 would limit the number of patients that a nurse can oversee in a hospital. California is the only state so far to mandate nurse staffing levels.